There's an old saying, 'What goes up must come down!' Well that might be the case in some instances but it certainly didn't feel like that on Sunday during my second Challenge the Evans Ride It Wiltshire Downs 80. Things went up and up and up all day but lets start - as always - at the beginning. Again it was an early start, not as early as last time but stupidly early for a Sunday morning. This time though there would be no knock at the door, I was going to be doing this one alone. Lee wasn't going to be with me. The weather looked good for the day, forecast was dry but overcast, which I was pleased with being the end of October and all. I had pre-packed the night before and checked my bike - I was ready to go! Loaded full of High5 Gels and my Bulk Powders Protein at the ready I loaded the car with my bags and bike and set of for Lacock College. Registration didn't open till 8am so I had plenty of time to get there, register, get changed and sort my bike out ready to roll out about 0830 hrs. I arrived at the start and already there were a lot of people there fiddling with their bikes and milling around the car park. I pulled in, parked up and made my way to registration. Following the puncture-gate debacle I'd spent a bit of money on some inner tubes and a little saddle bag to carry them in. The only thing I hadn't sorted was means to blow up said new inner tubes. Thankfully the helpful folk of Evans Cycles had a little stall set up of accessories and spares so I spent a further £20 on a CO2 pump which I slipped nicely into my saddle bag. So the time had come to make my way to the start, felt a bit odd doing it on my own, but I had my music this time so had something to keep my mind occupied. I made my way to the start line and queued up with all the others who had the same idea to start as early as possible. I just hung around and waited to be called forward with the group and get through the timing tent. At last I was off! A little later than expected but the ride had begun. Considering I hadn't been on my bike, apart from a 2 mile spin around my village, since the New Forest 100 I felt pretty good. I rolled out of the college and made my way out to the route following the signs. I hadn't really set myself a goal as I didn't know how I'd feel after the 100, but as I made my way through the first few miles I thought 5 hours would be a decent attempt. So that was set and I got to work! After 5 miles the route planners had thrown in a cheeky little climb up Church Hill. At just over a mile long and 114m in elevation it was a nice little test early in the ride, which I felt really good after reaching the top. It was a good little 'warm up' for the legs considering what was to come. At the 7 mile point another climb, roughly the same as the first about a mile long and just over 114m high it was another little tester for the quads. Once again at the top I felt reasonably good, I didn't hurt and actually dropped a few other riders on the way up. I was starting to think that the 5 hour target may have been a bit high and that perhaps I could go sub-5! Why not? The start had been good my pace was high and I felt great! The next 45 minutes or so went by without any incident the terrain was up and down but nothing that I would consider testing. My average pace was up and down too but hanging around the 17.6mph and 18.1mph. The 5 hour target was going to get smashed if I could keep this going. The way I was feeling there was no reason why I couldn't. I knew the first feed station was close, I felt that good I was considering skipping it and carrying on to the second station without stopping. I checked my bottles and one of them was near empty, I made the decision to stop and refill, a decision that proved priceless! I pulled into the feed stop at All Cannings, refilled my bottle with water and had a cheeky chocolate brownie and was away again. A very short stop as I didn't want to lose the momentum I had. 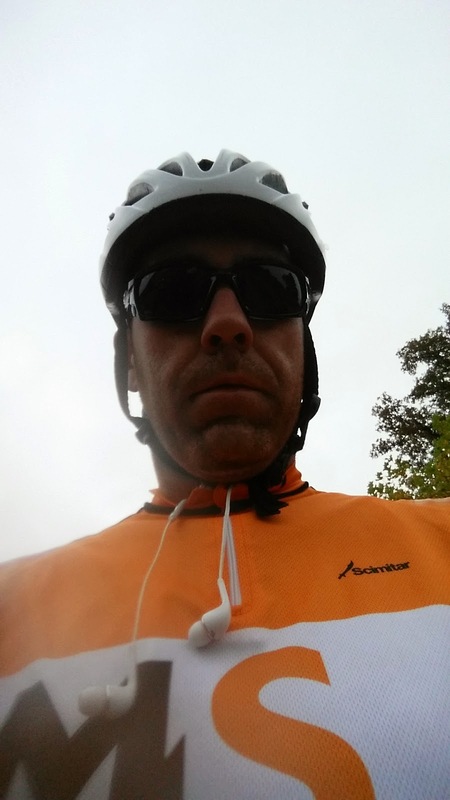 I got back on the bike and started the second part of the ride. The weather had turned slightly it was still dry but the wind had picked up dramatically. It was, at some parts, hard to keep upright on the bike the wind was that strong. But I just kept peddling knowing the next feed station was about 26 miles down the road. However this was going to be without doubt the hardest 26 miles I had ever done on a bike. It felt like the whole section was uphill, two reasons. One it was uphill pretty much all the way and two the wind was so strong that even the flat(ish) parts felt like a huge climb! The hills just kept coming - up and up and up. Every little bend brought more hills the horizon always seemed to be above me and never reachable. On some flat sections I was in the lowest gear - and peddling like my life depending on it - but the wind was so strong it felt like I was riding up Everest! My legs were burning and my head kept telling me to stop! But I didn't, I refused, no amount of weather or hills were going to stop me. This was for charity and people had already donated a shed load of money to the cause, I was not letting them down, not now not ever! At about 49-50 miles I reached the town of Marlborough, which made my heart sink. Knowing the town as I do I knew there was a monstrous climb ahead right through the middle of the town. 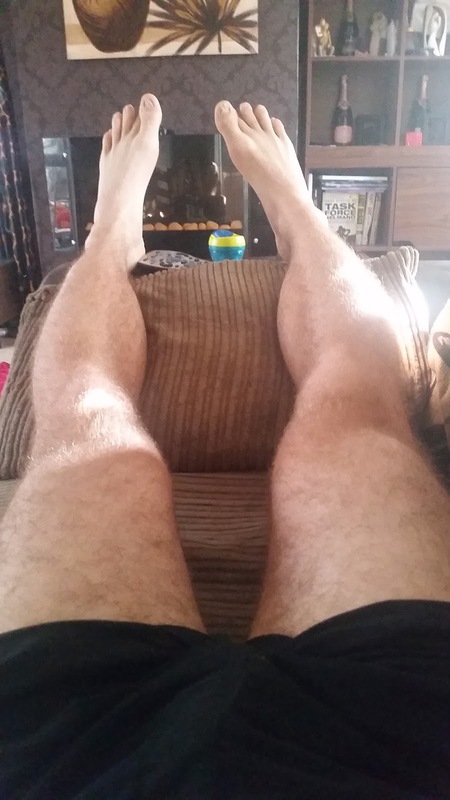 My legs were shot and burning like never before. The climb started and I wasn't the only one struggling, I passed about 5 other riders on the climb who didn't look like they were enjoying themselves very much. I knew that the feed station was about 6 miles away, what I didn't know at this time was that the 6 miles were uphill and not just a bump, I mean a proper climb! My average speed had dropped to 11mph and the last 5 miles had taken me 26 minutes to complete. All throughout I'd been in and around the 17 to 20 minute marker for 5 miles. The climb had killed me. The decision to stop at the first feed station had saved my ride. If I hadn't filled my bottle I would never have made it to the second stop. The High5 gels had been like a shot of adrenaline and kept me going. With only 24 miles left the 5 hour target was now again a proper target. In fact it was going to be a big ask now! I climbed back on the saddle and rolled out of the stop and was immediately greeted with a HUGE descent to the bottom of the monster climb! It was heavenly! Just rolling, no peddling. The organisers knew that the climb would have hurt folk and had tried to make the last third of the ride as gentle as possible. What they had counted on was the wind being so strong. The flats still felt like hills but with the pain of the last climb still in my legs everything felt 10 times harder than it should be. I just kept going! The thought of stopping was constantly in my mind. My head telling my legs that we weren't going to make it made life hard, but I knew people had faith in me by donating to my efforts, I've said it before I was not going to let them down! Not now, not ever. The miles rolled by and I just put my head down and peddled. I tried not to think of anything, humming along to the music in my head phones. All I could think about was the end, recovery and what I was going to treat myself to eat at the end. The cold was taking effect now too. Sweat and cold high winds do not mix. I'm not going to lie, I was freezing! 73 miles down and spirits were low - but knowing there was only 7 miles left I was perking up a bit. I turned a right hand bend and my legs screamed at me, not again. ANOTHER CLIMB! Really! Right, lets get up this and finish this ride, I said to myself, nothing is stopping me now! 4 miles the climb lasted for, it felt horrible! Just shy of 200m in elevation it was an absolute killer! I honestly didn't think I could make it. The wind was getting stronger and my legs were getting weaker but I kept going! I was going to make it no matter what. At the top I noticed a sign that said, 'Caution'. Not sure what I was to be cautious about my concentration levels soon peaked as the last 3 miles were a rapid descent to the end. The hill was steep and had some real sharp turns but never had I been so glad to be going down hill. No peddling for about 2 miles felt incredible and the last mile was almost flat. I started to notice landmarks from my drive to the start and knew I was close. My legs started to pump harder and the relief in my head knowing the end was close was unbelievable. I pulled into the college and started on the last leg, a few speed bumps slowed me down on the way in but right now I didn't care. I had my head down and was peddling to the finish. I heard a cheer and a familiar voice! I looked up and saw my wife and son stood on the side right next to the finish and my mother in law taking a few pics too! My heart skipped a beat! I was a little overwhelmed too to be honest. I was so happy they were there and it made me realise why I had carried on and why I wasn't going to quit. They had faith in me and supported me all the way. I sat up and waved like a crazy person - almost forgetting that the finish was a sharp left hand turn with a bollard in the middle! I'd done it! Finished! I stopped my Garmin and looked at the time, 5 hours and 7 minutes! I was over the moon, I knew that if the wind had been as strong I would have gone sub-5! I spent a few seconds crouched over my handle bars getting my head together and trying to find my legs. It didn't take long, Freddie (my son) came bounding round the corner shouting me and ran straight into my arms! No amount of pain I was in mattered right now it was all worth it. I'd completed Challenge 2 and to be brutal it was a challenge. It was without doubt harder than the New Forest 100. I was happy it was over! I sat on the steps and stretched my legs out. My mother in law bought me some pasta and a coffee, which didn't last very long but tasted incredible! The supporters said their good byes and I made my way back to the car. I put the bike in the back and changed out of my cold gear into some warmer clothes. I chugged back my Nurishment Active recovery drink and just sat in the car. My legs still didn't want to play, but I had to drive home and get a bath!! Never before had I been on a ride and thought I wouldn't get to the end! Never before had I experienced such high winds whilst riding a bike. 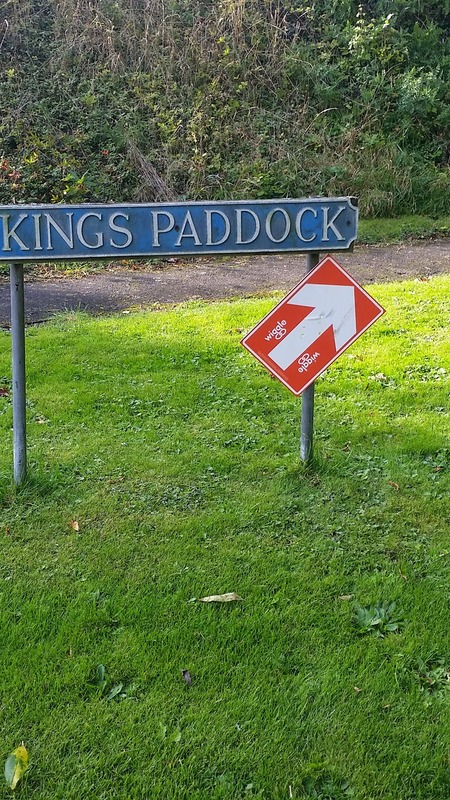 Never before had I ridden up so many long and steep climbs! But now I had! Challenge Two was done and dusted! It was without doubt the hardest thing I've ever done on a bike! But it was all worth it. 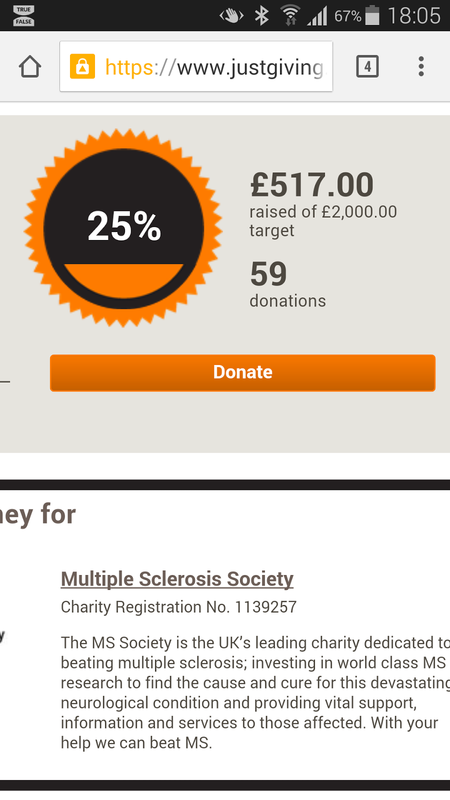 The donations had been coming in and by the end of Sunday I had broken the £500 raised barrier. I couldn't have asked for more. I was humbled and overwhelmed. 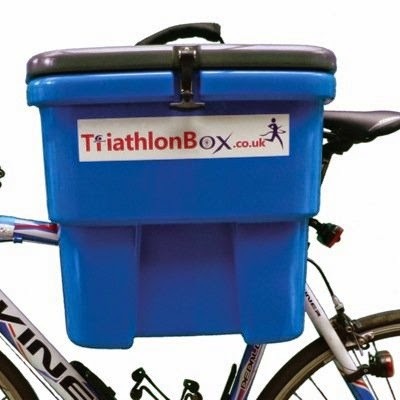 Challenge 3 is in March so the winter brings big training efforts and training targets. If you have read this and feel generous towards my efforts to raise money for the MS Society then please text KOMS99 followed by your donation (i.e. £1 £2 £3 £5 £10) to 70070 or visit my page at www.justgiving.com/Martyn-Seddon your support is gratefully received and pushes me on to do better things and make sure I complete the challenges ahead. Again I've added a link to my Garmin Connect for you to have a look at the ride. Thanks for reading and hope you've enjoyed it! At long last the day had arrived, Saturday 11th October 2014, my Charity Challenge was finally about to start!! It was 5am and I was awake led in bed knowing that the day ahead was what I had been waiting for! The night before I had packed, knowing how early the start would be. Spare clothes, a massive supply of High 5 Energy Gels, cycling shoes, MS Society Cycling Jersey, my new Garmin 910xt which had arrived the day before, helmet, gloves, drinks, Bulk Powders Protein shake, Nurishment Active recovery drink - surely there was nothing else I needed - apart from my bike of course. 0610 hrs and there is a tap at the window, it was Lee, a good friend of mine who had agreed to do the ride with me as support, LEGEND! We loaded my bike onto the rack on Lee's car grabbed the bags and set off. The start of the ride was just over an hour away from home so we knew we had plenty of time to get there find our bearings and be ready for the off at 0800 hrs (ish). Training had been going well and I was more confident than ever about completing the 100 miles, in fact I was that confident that I was thinking of a time goal. Anything under 7 hours, we agreed, would be our aim! We arrived at the venue and was promptly directed into the car park, which can only be described as a swamp full of potholes. We pulled up and surveyed our surroundings. We headed off to registration where we got a free coffee and had a quick look around the stalls that had been set out early doors. Quick toilet stop and back to the car get the bikes ready and get changed. It was about to start. Bikes ready, Bulk Powders Protein drank and my jersey stuffed full of energy gels we headed back down to the start line ready to roll out with the first group at 0800. 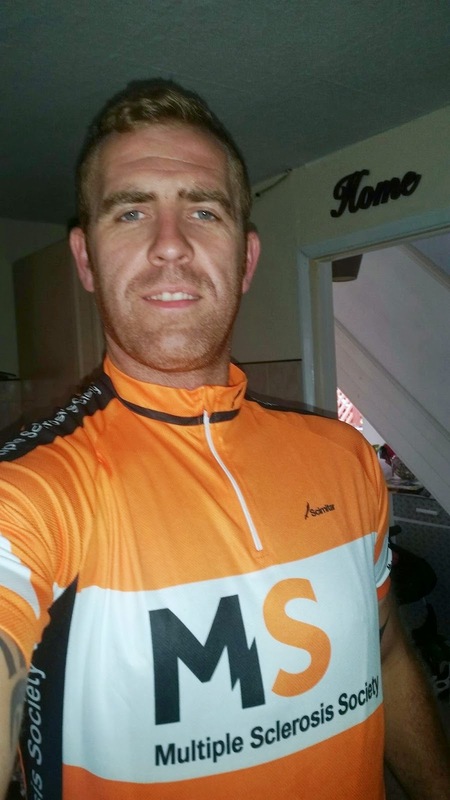 I made one last appeal on Facebook and Twitter for people to donate and help me raise money for the MS Society. We were ready, me and Lee were at the start line. The starter was going through some rules and showing us the signs to follow on the route. I was starting to feel excited and slightly nervous now. My first challenge, my first ever Sportive and I was about to do 100 miles on a bike - Here we go! We rolled over the start line and the adventure had begun. We followed the pack down a slight hill over some speed bumps and on towards the main road, then BANG!!! 200 yards into the ride and my back tire went flat! A puncture!! WHAT!! I couldn't believe it weeks and weeks of training, the build up, the fundraising and I'd managed 200 yards! I knew there was something I'd forget when packing the night before, inner tubes!!! Thank god for Lee Weston!! My old buddy had an inner tube! Life saver. 10 minutes later and we were back on the road now tagging along with the second group but we were away. 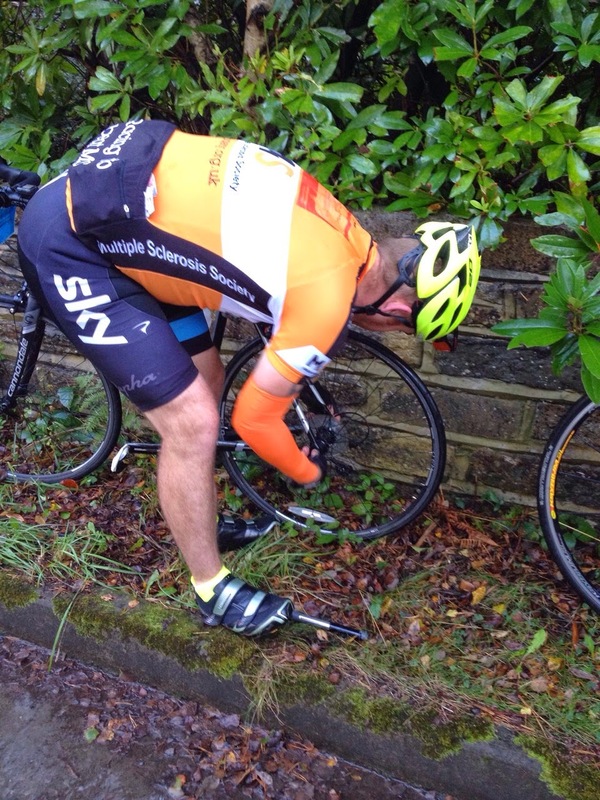 200 yards in and a puncture! Great! The first hour went with very little incident, we both felt good and had covered about 15 miles. No problems, mostly flat and no mishaps! I will never forget that right hand turn and seeing the first real challenge of the ride, the first climb. It was a long climb but steady. Not to steep but gradual in gradient. It was tough but I just kept tapping it out and pushed on through, at the top I looked back and couldn't see Lee. I knew I was only about 10 miles from the first feed station so carried on and decided to wait there for him. A steady first hour. Lee giving us a little wave! 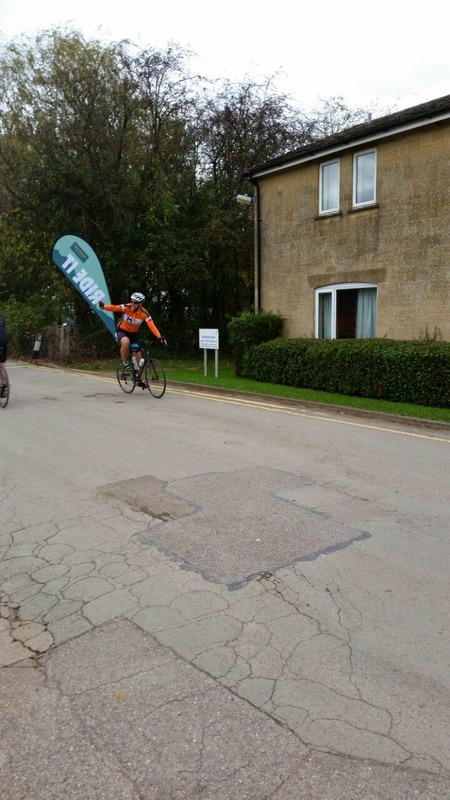 The first feed station came at 32 miles in to the ride. I was feeling pretty good and grabbed some refills and waited for Lee, who was only a couple of minutes behind. It was a good job that I was feeling good at this stage as the next section of the ride was really hard. There were only 23 miles until the next feed station but as soon as we pulled away from the stop we started another big climb. In fact there were a lot of big climbs! About 15 miles in my legs were feeling dull, I kept the energy gels consumption high and me and Lee stuck together helping each other up the hills and drafting on the descents. We kept going at a good pace and reached the second feed station in good time. We took a bit of a longer stop just to catch our breath and find our legs. After a couple of minutes we got back on the bikes and set off again. 22 miles to the next stop and if I thought the last section was difficult, I was wrong! This was hard! Real hard! About 8 miles down, during yet another climb and POP! There goes my front tyre! Another puncture, now the rain was coming down hard and it was as cold as ice. Now we were ruined! Lee was out of inner tubes and I didn't pack any! As we were stuck on the side of the road wondering what was next, two other riders stopped and very kindly gave us an inner tube and a pump. I didn't get their names, so can't thank them personally, but they knew how grateful I was at the time. Again we were on the road, up hill of course. About 60 miles in and the pedals where ticking over nicely, unfortunately at some point me and Lee got separated knowing that waiting at the feed stations had worked before I cracked on. I caught up with a group just ahead of me and clipped onto the back of them. Using them to draft on the flats I managed to keep up a good average speed. We reached the village of Pitton, about 65 miles in and knowing the area well I knew that White Hill was approaching. White Hill!! A 14% gradient climb over 127 feet and 0.3 of a mile. Doesn't sound a lot on paper but believe me it is without doubt the hardest thing Ive ever done on a bike. Out of the saddle and leaning so far over the handlebars I thought the bike would tip over I pedalled for all I was worth. A few in front of me couldn't make it and one person even snapped their chain, it was the type of climb that if you stopped you were not getting going again! At the top it felt like I had conquered the Alps d'huez. 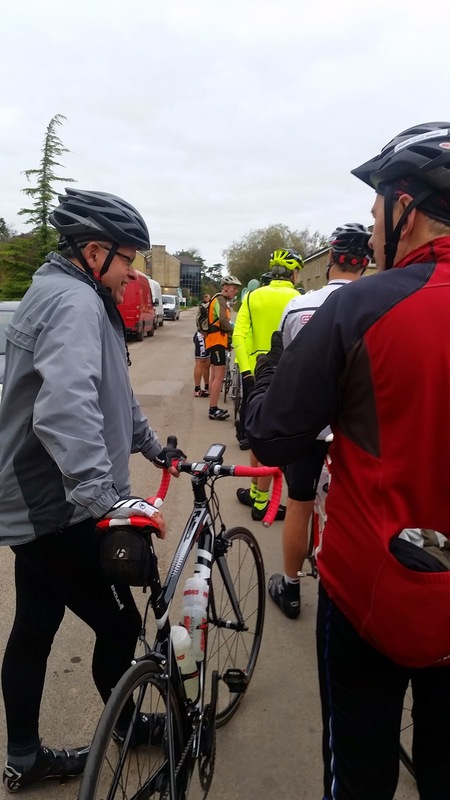 With only 12 miles to go to the last food stop I sat back in the saddle and enjoyed the little descent out of Pitton and rolled on to the stop. The arrow to White Hill!!! The stop was just ahead and I slowed down to pull in, I looked up and saw another rider coming towards me going the wrong way and not looking, I had to swerve to avoid him and braked hard. My front wheel went from underneath me on the wet surface and I couldn't unclip my foot from my pedal fast enough. Down I went like an anvil out of the sky crashing on the floor. A few of the support staff ran over asking if I was ok, I replied with, 'Yeah Im fine. Just get me a pillow and I'll be even better.' A heard a few laughs and hoped it was at my comment and not the fact that I had crashed. One of the staff unclipped my foot and I got up and instantly noticed that all the other riders looked concerned. I told them I was ok and limped over to the food and drinks. I'd grazed my leg and fell onto my knee. It wasn't too painful, for now. I waited for Lee and a few moments later he showed and instantly commented on how hard White Hill had been! I agreed and told him of my little crash, he laughed! 23 miles to go now and we knew from the profile that it was mostly flat or downhill all the way. We stayed together with about 10 miles to go when we tagged onto the back of a group that I felt were slowing us down. I powered on past them and just put my head down and went for it with all I had left in my legs. 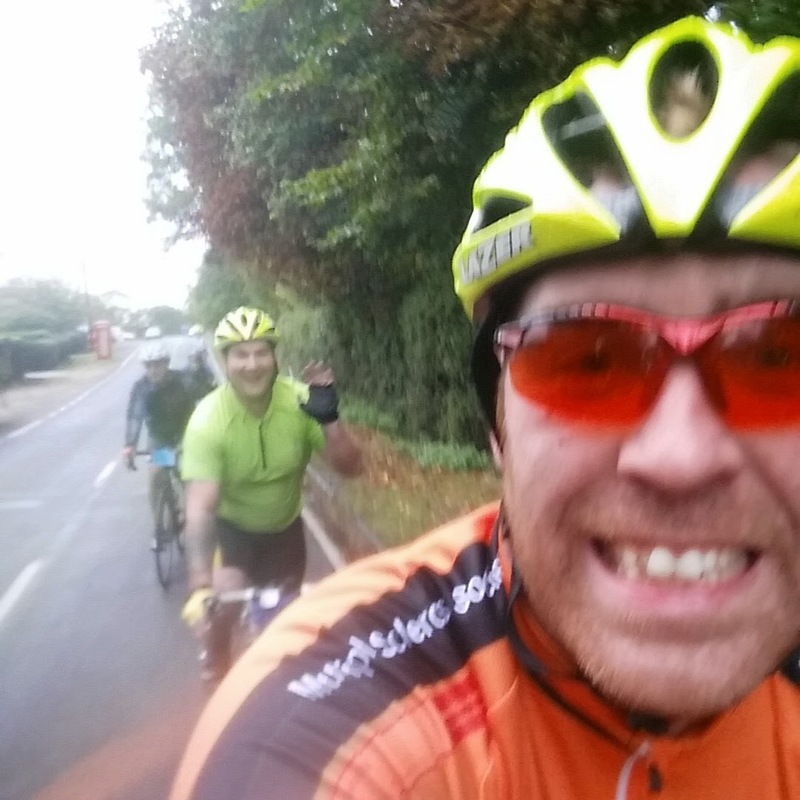 The miles on my Garmin were ticking over mile after mile I could feel the end approaching, I looked back and couldn't see Lee, I had inadvertently dropped him in that group. I was gutted I really wanted to cross the line together but knew that if I started to slow down know I would lose my legs. So I carried on. 10 miles and I was still at it! Legs pumping and I was catching group after group. Not slowing down and keeping the cadence high. I was so close now and knew that time was now my enemy! The final few miles approached, I tagged onto the back of a group and used them to pull me over the finish line. About 1 mile to go and I broke away from them. I could now see the line, a big orange and black inflatable with the words FINISH emblazed all over it! Never before had I been so happy to see the end of a ride. I crossed the line and stopped my Garmin. For the first few minutes I didn't look at the time, I was handed a medal and a t-shirt by some very happy support staff. I unclipped my pedals and got of the bike. I'd done it! 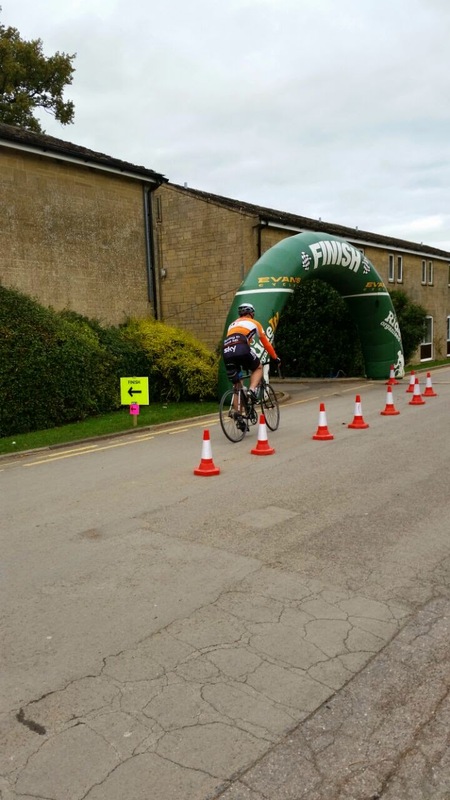 100 miles on a bike - the time - 6 hours 23 minutes! I'd broke the barrier we had set too. As I turned around Lee crossed the line too, 2 minutes behind! Lee had done it as well. The sense of achievement was some what overwhelming, the whole concept of the challenge year had started with the idea of doing a 100 mile ride and now the first of my challenges was complete! After a massage, coffee and a hog roast roll, the world around me seemed to come back to normality. Not being sat on the saddle of a bike felt a bit odd. 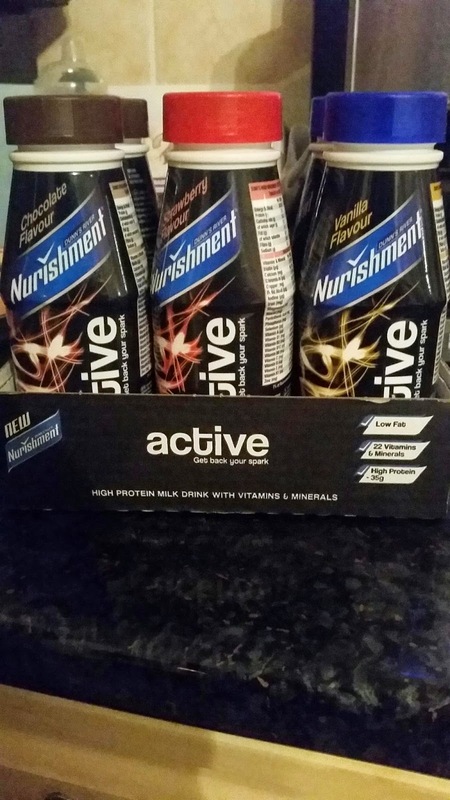 At the car I drank my Nurishment Active recovery shake which, in itself, is a meal in a bottle. A much needed shake at that. I had one for Lee too who happened to say how good it was also. My wife and son had also arrived , I was so glad to see them both. The support my wife has shown me during the build up to the ride was second to none and still is during the build up to the next challenges. To have them there at the end made such a difference and brought it all into perspective for me. We sat and chatted for a while before they left and me and Lee packed the bikes up and got back on the road home. 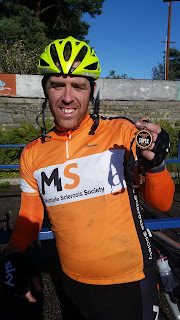 Medal, t-shirt, mug, scars, cuts, bruises, sore bits, dirty bike, dead legs and a tired feeling that Ive never experienced was all completely worth it. I logged onto my Just Giving page and the donations had been rolling in all day. By the end of the weekend I had raised £424. I couldn't have asked for more. So now challenge 2 approaches, a mere 80 miles around the Wiltshire Downs, and training continues. I'm still on the fundraising march so if you have read this and feel compelled to donate please visit my page www.justgiving.com/Martyn-Seddon or text KOMS99 followed by your donation to 70070. 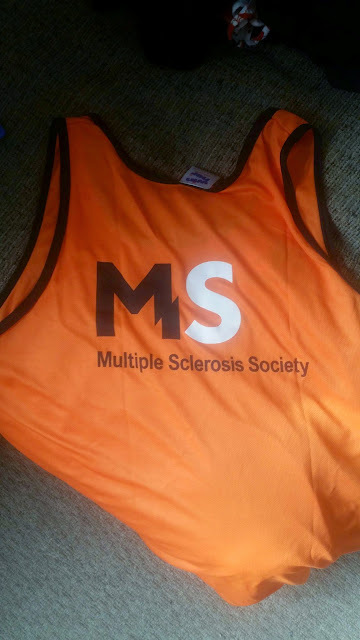 Its all to raise money for the MS Society. 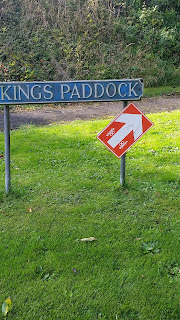 There will be more blogs to follow - one after Sundays ride too. I hope you've enjoyed reading this. Below is a link to my Garmin Connect where you can see the ride have a look and see if you could have a go yourself. Training began around 18 months ago, however during the summer of 2013 I suffered a slipped disc in my neck and training was halted. I decided that in terms of my training the year was over abruptly and didn’t return to training until I felt fit and able. On the 7th of January 2014, I returned to full training. At this point I tipped the scales at over 17st and I was struggling to run a 5km in less than 30 minutes. I had cycled a 30 km route and really struggled to break an average of 20 kph. Things looked grim. In my mind I knew what I wanted to achieve, but things looked really tough at this point. 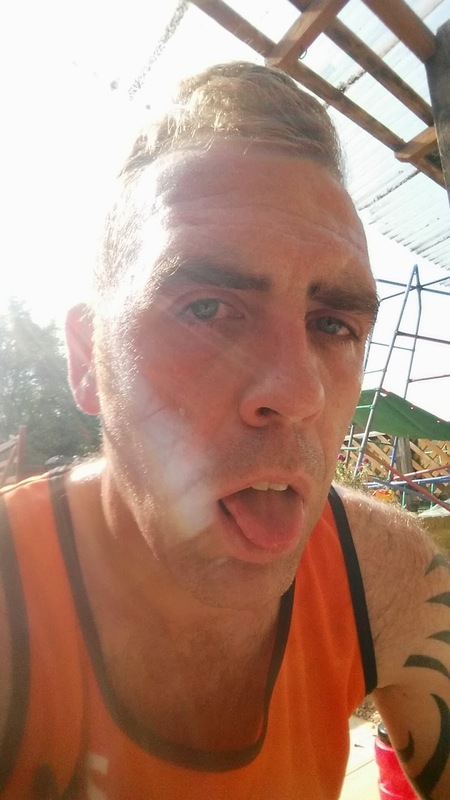 Not to be defeated I decided to start running as well as cycling! What hurt the most was the fact that I couldn’t run 5k within 30 minutes. I felt that my personal pride was dented. Because of this I decided that I needed to set myself some goals. Starting with a sub 30 minute 5k. I was motivated so I stuck at the running. I was a plodder with a purpose. I may have looked like a missing zoo creature bounding around the village, but to be honest I didn't care. I had a goal and I was going to hit it regardless of what other people thought. The next few weeks were tough. I was running 4.5km in 32 minutes. Not only was I 2 minutes over my target, I was also half a kilometre off the distance too. I felt my fitness improving, so I knew there was hope and light at the end of the tunnel. Each run increased my fitness and gave me a belief. I had also given up smoking on the 7th of January, the same day my fitness regime had started. For some time I had been using apps on my phone to record my running data. One morning mid-March, I decided I would go for an early morning run. I laced my running shoes up and it was freezing cold. I went on my plod around the village. The run started well and the lady in my ear was giving me my split times at each km I ran. By the time I'd reached the 3 km mark I'd realised I was running quicker than ever before and still felt good. So I carried on. Getting closer to home and that 5km barrier, which I had now marked out properly. Then 'BOOM' it was done - 28.06 min over 5km. I had only gone and bloody done it! I was so happy. Such a small achievement meant so much to me. It was a mini goal that now meant I could go further and faster than ever before! My mind was now set! I was ready to do it! Fast forward a few months and the training continued. With some excellent advice and tips for training from my good buddy Anthony Durkin (@therunnerruns) I'm now running 5km in 26 mins and running a 10km in 58 mins. I'd have laughed in everyones face at the start of the year if you'd have told me I'd be running 10km. The training is going well and the running gets better and better. Remember I had no professional coaching I just kept going. Fighting the urge to quit, fighting against me telling myself I couldn't do it I'm proof that the fat lad at the back can improve and become one of the fast lads near the front. I'm now weighing in at under 15st which I couldn't be happier with. Trust me, if I can do it anyone can do it. 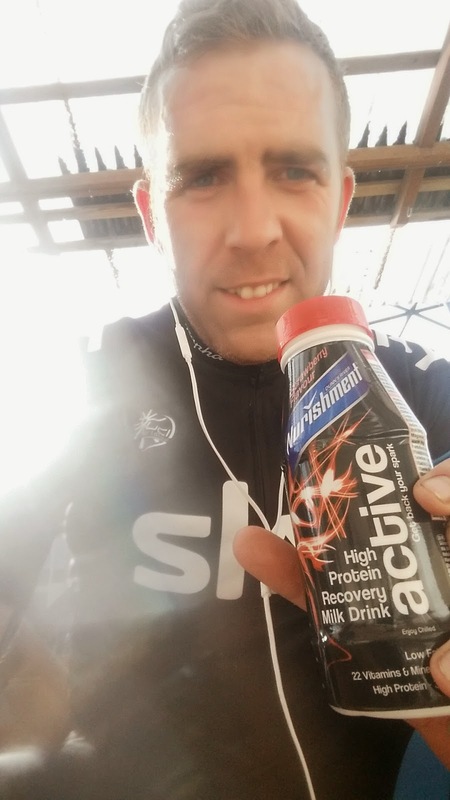 Special thanks also must go to High5 Sports Nutrition (@High5Nutrition) for their quality products which I use before and during my runs. The energy gels and hydration drinks tabs are brilliant and really make a difference. An extra special thanks Jodie Smith too at High 5 Sports Nutrition who has always been on the end of an email for me. 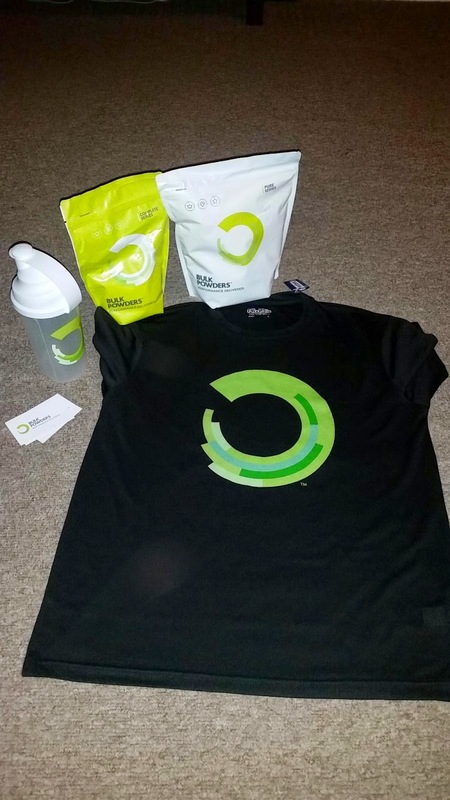 I fully recommend checking out High5 Sports Nutrition's products. My next blog will be live in a couple of weeks. 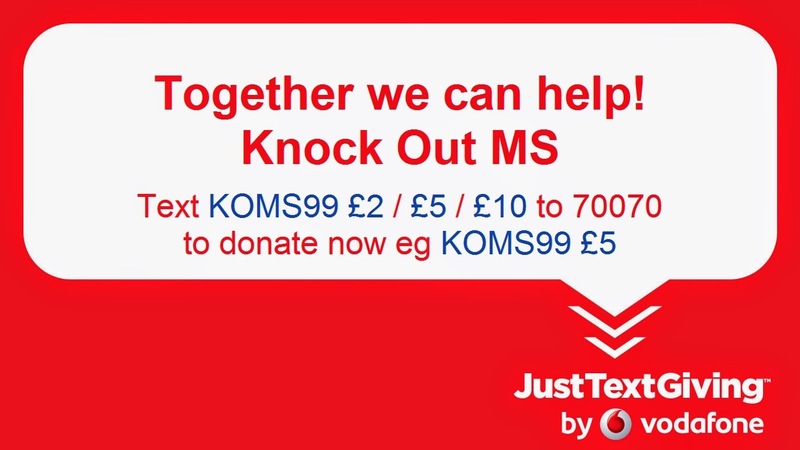 Thanks for reading and don't forget this is all for charity so give what you can by texting KOMS99 plus your donation to 70070 or visit http://www.justgiving.com/Martyn-Seddon.